Selects the interface language; currently Dutch and English. If there is enough demand other languages may be added. Ask confirmation on (accidentally) canceling a dialog after changes. Select whether to show hint balloons when the mouse hovers above a button. Let MusiCAD keep track of position within a file during playback. Select whether MIDI-I/O should be released when MusiCAD loses focus. If checked, MusiCAD will test for available updates at each program start..
GhostScript is a free implementation of the PostScript language which enables MusiCAD to save music as PDF, JPG and PNG. By default all printing is performed using GhostScript. The GhostScript dialog [Options|Preferences|GhostScript] makes it possible to fine-tune GhostScript operation and even replace GhostScript with another postscript interpreter, as is required when using GPL-licensed software (GhostScript) bundled with non GPL software (MusiCAD). It is possible to print without GhostScript: just unmark GS. The filename of the actual GhostScript executable. Directory where the GhostScript files are located, usually a subdirectory of the main installation directory. MusiCAD will draw black notes on a white page by default. 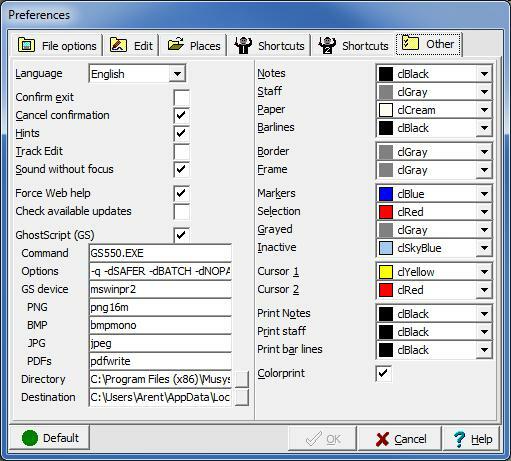 You may override the coloring scheme as needed/desired using the right pane color settings. Staff lines are drawn gray by default. Some printers show the color grey with quite large dots. Setting the staff line-color to black will circumvent the dithering problem. Must be activated to print colors. On a black&white printer you should disable color-printing.